� DTI-SPOT� Cross-platform overlay tool to superimpose DTIStudio fiber tracking results on 3D volumes. � MIPAV Philips PAR/REC File Format (JAVA) � Native support for PAR/REC within MIPAV and the MIPAV development environment. ViPAR (Visualization, Paint, Allignment and Rotation) is a MRI visualization and manipulation tool that enables real-time 3D transformation of MR volumes and delineation of regions of interest on arbitrary planes. It is available as a plugin to MIPAV. 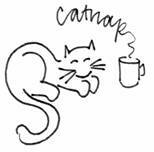 CATNAP (Coregistration, Adjustment, and Tensor-solving � a Nicely Automated Program) is an end to end data processing pipeline for Philips PAR/REC files. CATNAP performs motion correction for both diffusion and structural images using FSL FLIRT, adjusts the diffusion gradient directions for scanner settings and motion correction, and estimates tensor and derived quantities. The results are readily compatible with DTIStudio, FSL, and other tensor analysis packages. 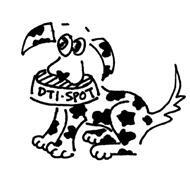 DTI-SPOT (DTI Superposition Of Tracts) is a cross-platform user interface for superimposing DTIStudio filber tracking results on 3D PAR/REC and Analyze Volumes. 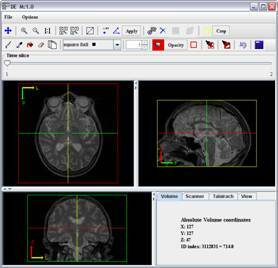 Combined images are available in DICOM and Analyze (RGB) format and are readily compatible with general purpose DICOM visualization packages. 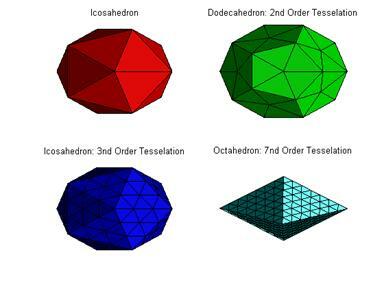 Small Matlab scripts for creating and visualizing the Platonic solids and their tessellations. Notes: If you find this software useful, please let me know [landman (at) jhu.edu]. 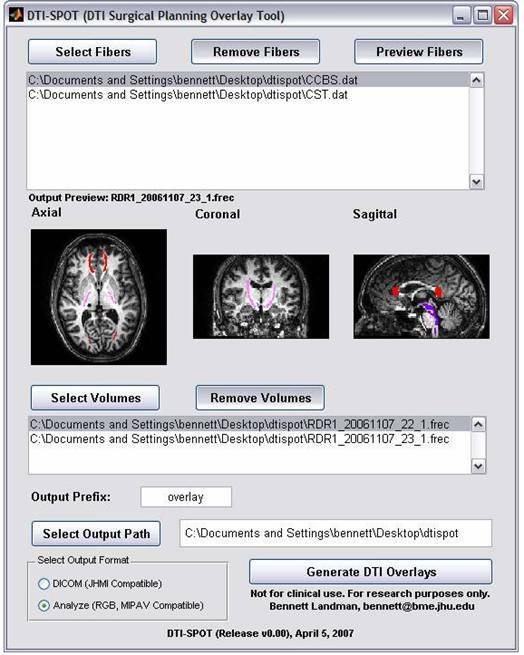 The PAR/REC file format toolbox enables robust parsing of Philips MRI research file format volumes. As of this beta release, PAR versions 3 and 4 are supported. 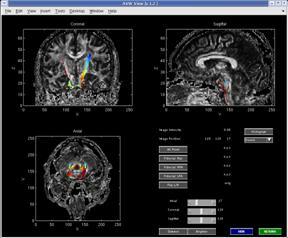 Direct visualization is integrated with the MRI_TOOLBOX (Darren Webber). Multi-volume and arbitrary slice ordering are correctly handled. PAR/REC files may be written to or generated from Analyze format. Most scripts containing �REC� have alternate versions with �fREC�. This file format is identical to PAR/REC with the exception that the REC file is 32 bit floating point rather than 16 bit unsigned integer. The scaling defined in the PAR file is automatic. This toolbox supports either par/rec or PAR/REC, but both the par and rec must have the same capitalization structure. All par files generated by this program have �v2� appended to the end to indicate that they were not generated by a Philips scanner. We attempt to exactly preserve the format structure, but the formatting of the numbers may be different (e.g., 0.00 versus 0). Many other functions have been included in this toolbox that relate to various MR formats. Please let me know if you can comment on any features, bugs, or general concerns. Release 1.1 includes support for MIPAV�s minimal PAR/REC file format. 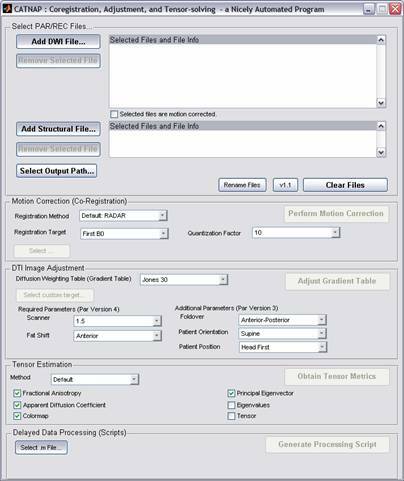 The PAR/REC file format support enables robust parsing of Philips MRI research file format volumes. PAR versions 3 and 4 are supported. Multi-volume with linear slice ordering is correctly handled. All files must be little endian. Support has been release for internal use and will soon be available externally. A basic premise of DTI is that the tensor formalism (e.g., assumption of Gaussian diffusion) meaningfully represents diffusion processes, and thus the derived contrasts are relevant. Yet, not all tensors represent physically possible processes (e.g., those with negative eigenvalues); typical log-linear mean squared error methods can result in these non-physical solutions. Various non-linear tensor estimation frameworks have been developed to prevent these problems (Tschumperl� and Deriche 2003; Cox and Glen 2006; Niethammer, Estepar et al. 2006), while regulation and robust tensor estimation methods employ spatial correlations to lessen the effects of noise (Mangin, Poupon et al. 2002; Chang, Jones et al. 2005). Despite the emergence of new methods, little evidence has been presented to provide equivalent experimental comparisons or enable well-informed selection of the appropriate tensor estimation method for a particular task.